Last week we moderated a SkypeCast with Chris Anderson, editor in chief of Wired Magazine, and author of the best-selling book, The Long Tail. If you missed the SkypeCast, you can listen to our conversation here, in our inaugural TypePad podcast. Or you can grab the 18mb MP3 directly. Many thanks to Chris for participating, and stay tuned for more TypePad podcasts. If you're reading this on our (newly redesigned) blog or inside TypePad, you've probably noticed that things look a bit different around here. (For those of you reading from the safe confines of your RSS reader, come take a look!) Here's a bit of detail about how we've spruced the place up, and about a new feature we added to TypePad that we're excited about. First, we launched a fairly significant overhaul to the public face of the TypePad website. One of the things we learned in reviewing visitor feedback, site traffic patterns and our customer research was that our old site wasn't doing a good enough job explaining blogging to the uninitiated. With the redesign, the site's more focused on explaining why you need a blog, and the benefits of blogging on TypePad. TypePad members coming to the site have probably noticed that we've changed the login box to a "Members Sign In" link. This link will take you directly into the TypePad application; we'll only ask you to log in if we we don't have an active session for you. For most users, this simple link (as opposed to the ever-present login box) will result in faster access to the application. Plus, once you're inside the TypePad application, you can always bookmark the new "Home" tab. Which brings us to the second thing we released -- the new "Home" tab inside TypePad. We've revamped the application's home page to give you quick access to your blogs, your photo albums and your TypeLists, as well as easy ways to keep up on the news at Everything TypePad, our Featured Blogs and Widgets. We also hope you find the rotating selection of Tips helpful. Keep your eye on it; you might just learn something new. Finally, we threw another "most wanted" feature into the release as well. You can now easily add Technorati Tags to your blog posts. While Technorati has always treated TypePad's categories as tags in their tag search, you can now go beyond categories and add additional labels to your posts. So, for example, you might file your review of Miami Vice in the "Movies" category, but tag it with the additional labels Miami Vice, Michael Mann and genius. Check out our Knowledge Base article "Using Technorati with TypePad" for details on how you can customize the display of your Compose page to add Technorati tags to your posts. Back in October 2004, Wired editor-in-chief Chris Anderson penned one of the most influential magazine articles of recent times, "The Long Tail." The Wired cover story explored the impact that improved searching and better filters have had on selling products and services, making it possible to profit from items that aren't "hits" in the Top 100 sense. Increasingly, Anderson suggests, niche products that alone sell relatively few units will together make up the majority of sales for many businesses. The idea has become one of the most popular memes for bloggers who write about business and culture, and over the past 20 months has taken hold in the mainstream as thinkers and consumers alike realize the implications of the shift. 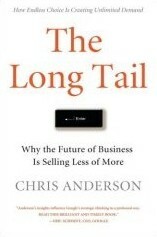 And Hyperion has just published Anderson's book The Long Tail: Why the Future of Business is Selling Less of More in hardcover. On Monday, July 24 at 1:30 PM PDT, we'll be hosting a moderated SkypeCast discussion with Anderson. To participate, all you'll need is Skype and this link: skypecasts.skype.com. We couldn't be more excited about this event! In the meantime, check out our interview with Anderson over on featured.typepad.com, where he talks about how he used his TypePad blog to expand on the ideas in the original Wired article, connect with his readers and evolve his thinking about Long Tail economics. We've now restored all user data. If you are still experiencing any issues, please open a support ticket. We apologize for the interruption in service that occurred during most of the day on July 12, 2006. We experienced a database problem and needed to take the system offline to repair it. Weblogs were never down, and the application came back up about 7:30 pm PDT. If you made any changes to your weblog during the period 12:30 am to 10:30 am PDT, while the application was available intermittently before we took it down, you may need to take steps to restore those posts from your archives. This does not affect all users, but only those who posted between 12:30 am and 10:30 am. If you did not make any changes to your weblog between 12:30 am and 10:30 am on July 12th, your weblog content will not be affected by the application downtime. If you did post during this period, these posts are not available inside of TypePad. However, they have not been completely lost and can still be found on your weblog individual archives. We've written a knowledge base article, Restoring posts from July 12, 2006 service outage to explain how you can restore these posts and their images. If you have any questions or experience any additional problems, please log in to your account and open a help ticket. Our Support team will be glad to help you. One of the motivations behind TypePad Widgets was a frequent customer question: "How can I share my del.icio.us links on my TypePad blog?" We were getting good -- too good -- at giving customers complicated instructions on how to do that, and decided there had to be a better way. And that, dear reader, is how Widgets were born. Which is why I’m thrilled today to announce Joshua Schachter and the other kind folks at del.icio.us added Widget support to their Linkroll and Tagroll features. If you’re a TypePad user, all you need to do to put your links or tags on the sidebar of your blog is sign in to del.icio.us, configure how you want your Linkroll or Tagroll to look, and click the "Add this to your TypePad blog" link under the box that has all the messy code (that you used to have to copy and paste). Many thanks to the del.icio.us team – the TypePad team couldn’t be happier.